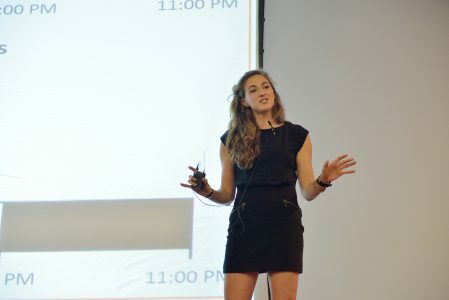 Graduate student Lauren Woodie, Department of Nutrition, Dietetics and Hospitality Management, was named First Place winner of Auburn University’s 2017 Three-Minute Thesis (3MT) competition on November 16. 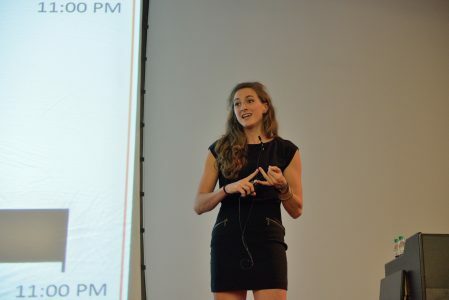 Woodie’s 3MT project, Time-restricted feeding of the Western-diet and its affect on obesity, metabolic dysfunction and cognitive impairment, was a combination of work by previous graduate students and her interest in diet-induced memory deficits. The original project focused on the impact time-restricted feeding (TRF) had on non-alcoholic fatty liver disease, which was a shorter study. During her first year at Auburn, Woodie did a lab rotation with Dr. Vishnu Suppiramaniam where she studied behavior and hippocampal electrophysiology. 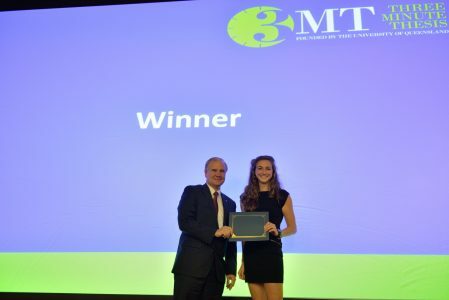 She and her advisor, Dr. Michael Greene, then combined his interest in TRF with her interest in how diet affects the brain which led to her 3MT project. Woodie spoke on the impact of time-restricted feeding. She uses mice to conduct various behavioral and metabolic tests. The mice live in metabolic cages for three days. These cages measure everything the mice do every 7 seconds. This allows her to see how much they eat, breathe, and move as well as whether their bodies are burning fats or carbs at a particular time. “A cool tidbit about my mice is that they were super sweet little guys,” said Woodie. She wanted them to be calm for behavioral tasks which meant getting them accustomed to her presence so she would often take them out of the cage to rub their heads and even talk to them. By the end of the experiment, they would calmly sit in her hand and observe the area. Woodie believes she had some of the most well behaved mice around.